NYC, 02/19/2019, 2:00PM. 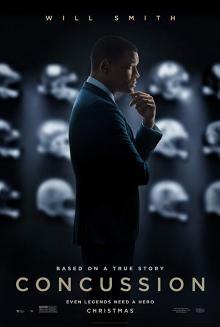 Concussion (2015): Sports drama based on an article starring Will Smith. Starring Will Smith, Alec Baldwin, Albert Brooks. Screenplay is based on the exposé "Game Brain" by Jeanne Marie Laskas, published in 2009 by GQ magazine. Concussion grossed $34.5 million in North America and $14.1 million in other territories for a worldwide total of $48.6 million, against a budget of $35 million. Will Smith earned a Golden Globe nomination for Best Actor.